"Wow for the first time ever I can eat the same as everyone else!" Whatever you can make, you can nearly always make it gluten free too - like these bagels as part of a 40th birthday buffet delivery. I used the normal Doves Farm gluten free bread recipe, but of course it is very sticky. Let it rest for 90 mins - 2 hours after you have mixed it. As well as letting the yeast rise, the resting time allows the various flours in the flour mix to fully absorb the liquid and the dough is thicker and firmer and much better to work with. Now re-mix the dough and shape it into bagel shapes. You do need a fair bit of gluten free flour (yes - make sure it's gluten free you use for dusting - easy mistake to use normal flour, then you have to start all over again!) on your hands & and the table top to make sure it doesn't stick. 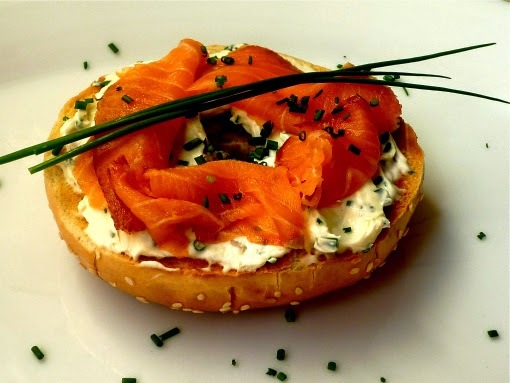 Let the bagels rise - this may take 1 - 1 ½ hours depending on the heat in your kitchen. They should double in size. The dough will still be very sticky at this point so here's a golden tip - put the tray of proved bagels into the freezer for about an hour so they go slightly hard on the outside. Now you can boil them like normal bagels and they hold together. Then bake as normal. Love your gluten free guests!